My great-grandfather recently passed away. He was an avid hunter during his lifetime and among his belongings my parents found a box of tanned deer hides. There was a piece of the paper packaging left from the taxidermist who processed the hides; it was postmarked May 23, 1956. I'm not sure what my great-grandparents intended to do with the buckskins (although it couldn't have been very urgent since the hides weren't used for more than 50 years). When my dad called to ask if I could use the skins, I immediately told him yes although I had no idea what I would do with them. For my first project, I decided on something small, just so I could get the feel of cutting and working with the leather. I have always liked chunky bracelets and, although they may be a bit masculine, I decided to make a cuff. 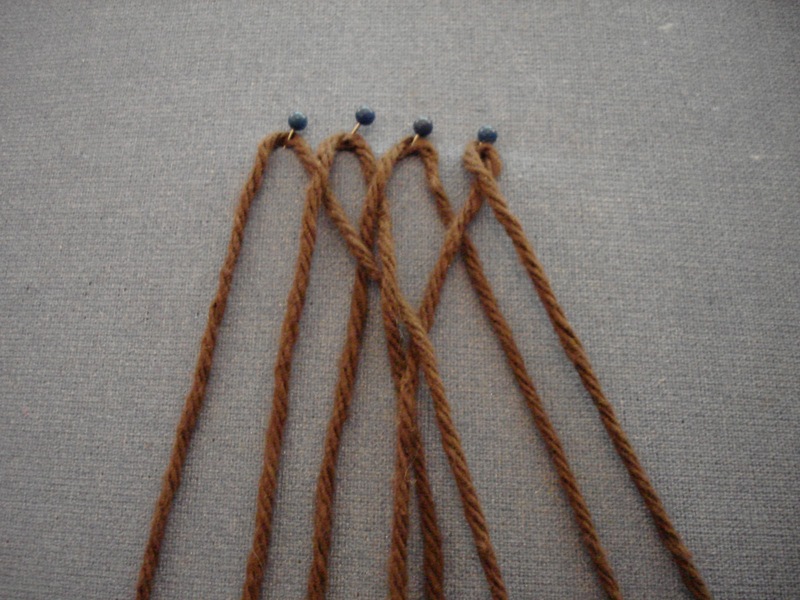 I was leafing through the book Quick to Make from the editors of Threads Magazine and saw instructions for braided belts. 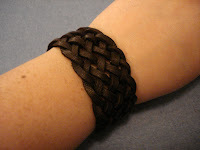 I loved the idea of an eight-strand braided bracelet but the instructions seemed sort of . . . complicated. After perusing countless websites on the subject, I decided to go with good old trial and error and work out an easier method. My wrist is about 5 1/2" around. The 8 strands are actually 4 lengths of cord folded in half. 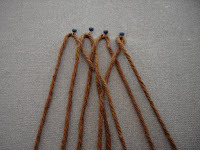 The strands braid to a little over half of their length. So, I cut four lengths of leather, each 1/8" wide and 22" long (5 1/2 doubled, then doubled again). I folded the strands in half then pinned them to my upright ironing board, as pictured. 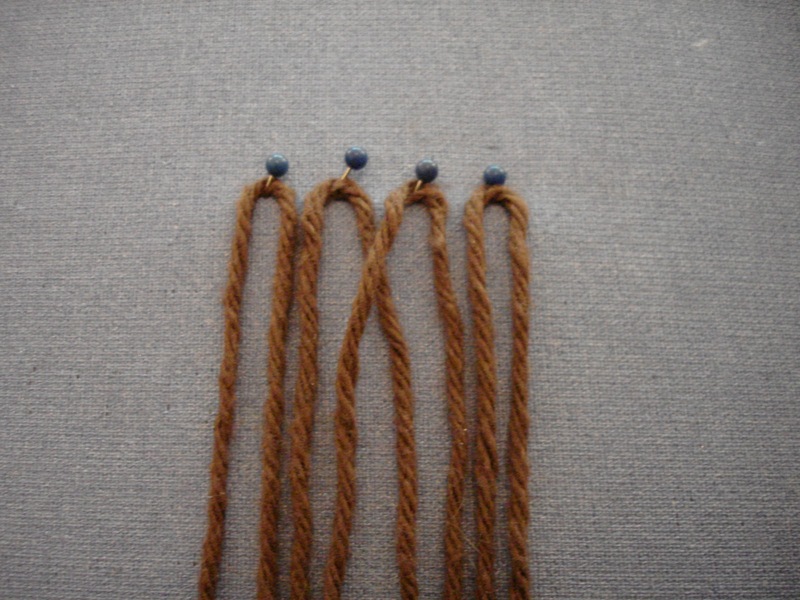 From left to right, the strands are numbered 1-8. 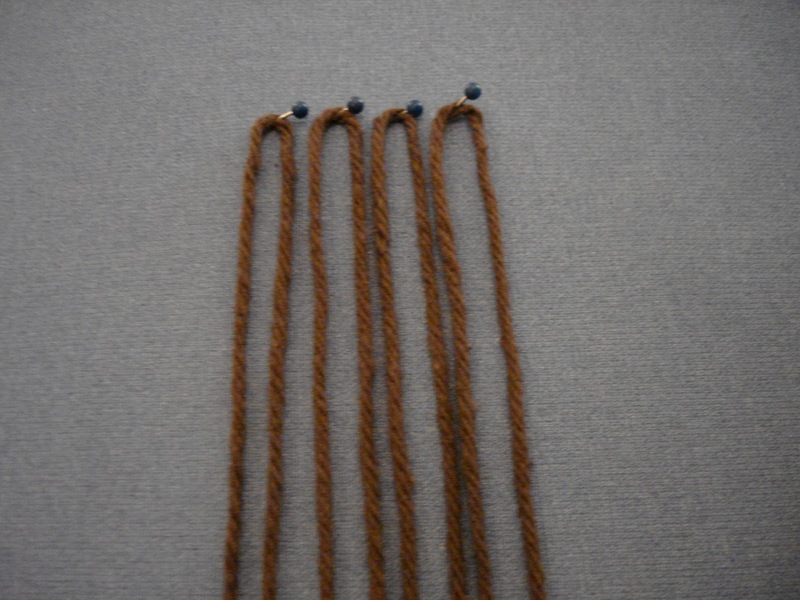 Every time a strand is moved, the lengths are renumbered 1-8. First, I crossed 5 over 4 (making 5 the new 4). Then cross 2 under 3, over 4, under 5. Next, 8 under 7, over 6, under 5, over 4. Then 1 over 2, under 3, over 4. At this point, I tightened all of the strands as much as possible without pulling out the pins. I should say, for illustrative purposes, I used yarn in the photos because it was easier to see than the strips of leather. After several more rounds, I pulled out the pins and tightened the slack at the top (sort of like tightening shoelaces), then I repinned the bracelet to the board. 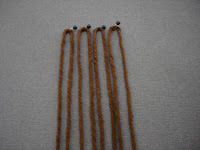 I continued the pattern for the length of the braid: 8 under 7, over 6, under 5, over 4. Then 1 over 2, under 3, over 4. Essentially, starting from the left the pattern is over, under, over. From the right it is under, over, under, over. 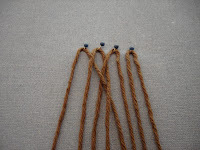 I continued to tighten the braid as I went. 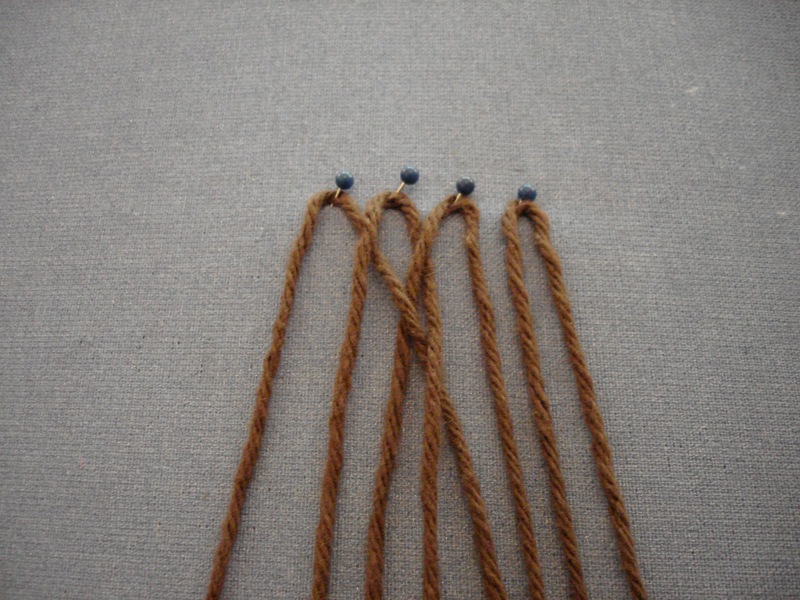 Once I reached the ends of the strands, I tightened the braid one last time and stitched across the loose ends. I pulled, stretched, tightened the braid until it was even and straight. I stitched a cuff of leather (about 3/4" long) over the loose ends. Into the other end of this small leather endpiece I inserted a loop for a button closure and stitched it in (I first hot glued the loop into place, though, to make it more manageable to stitch across). 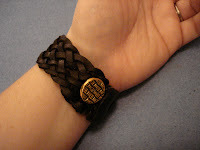 On the other end of the bracelet, where the braid began, I sewed a button in the appropriate place (see the photo below). Finished! I'm sure this is the first of many buckskin projects to come. The leather cut beautifully and was so easy to work with. This braid could easily translate into a cute belt or purse straps. It could be done in lengths of fine cord and used as trim or straps for a summer dress. The eight-strand braid is a lot easier than it seems and pretty impressive-looking when it is done. I hope you'll give it a try. Be creative and enjoy! It is beautiful! What a treasure! Love it! how do you end it? 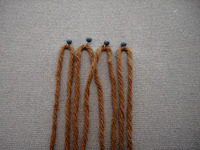 To finish the bracelet, I stitched across the loose ends, just to tack them. Then I cut a little rectangle of leather and fashioned it into a cuff (ring). I slipped the cuff over the loose ends to cover them and stitched it in place. Let me know if you come up with a different method for finishing the end--I'd love to see other takes on this project.